Eleven-year-old Jane Grandison, tormented by her stutter, sits in the back seat of a car, letter in hand inviting her to live and study at the Sybil Joines Vocational School for Ghost Speakers & Hearing-Mouth Children. 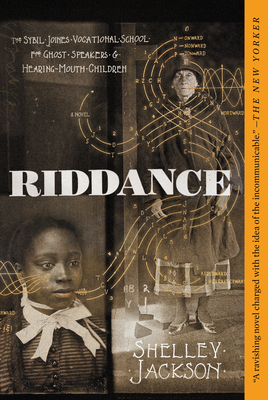 Founded in 1890 by Headmistress Sybil Joines, the school--at first glance--is a sanctuary for children seeking to cure their speech impediments. Inspired by her haunted and tragic childhood, the Headmistress has other ideas. Pioneering the field of necrophysics, the Headmistress harnesses the "gift" she and her students possess. Through their stutters, together they have the ability to channel ghostly voices communicating from the land of the dead, a realm the Headmistress herself visits at will. Things change for the school and the Headmistress when a student disappears, attracting attention from parents and police alike. Set in the overlapping worlds of the living and the dead, Shelley Jackson's Riddance is an illuminated novel told through theoretical writings in necrophysics, the Headmistress's dispatches from the land of the dead, and Jane's evolving life as Joines's new stenographer and central figure in the Vocational School's mysterious present, as well as its future. Shelley Jackson was born in the Philippines, raised in Berkeley, California, and currently lives in Brooklyn, New York, with her husband, her daughter, and a three-legged dog. She received a B.A. in art from Stanford University and an M.F.A. in creative writing from Brown University. She is the author of the short story collection The Melancholy of Anatomy, the novel Half Life, the hypertext novel Patchwork Girl, several children's books, and "Skin," a story published in tattoos on the skin of more than 2,000 volunteers. She teaches in the graduate writing program at The New School.